Will another hug be Charlie Crist’s downfall? Every person in Florida, and around the country, has heard about “the hug”. President Obama came to Florida, and then-Governor Charlie Crist greeted him with a hug. It was after that hug that Charlie Crist started to see his position in the Republican party decline. Or so he wants everyone to believe. Charlie Crist lost the 2010 Republication nomination for US Senate to Marco Rubio, after leading Rubio by double digits. Crist has recently been in the news for playing what some would call “the race card”. Crist is now saying that he left the Republican Party because of racism. He can attempt to revise history all he wants. but an article by Chris Cillizza appearing in The Washington Post brought a great dose of reality to Crist’s claims. No one is saying that there aren’t racists in the Republican party. In fact, a lot of them. However, Charlie Crist was just fine with that racism while he was still beloved by the Republican Party. In fact, racism never came up when he switched parties to Independent to try to win the Senate race after losing the Republican nomination. In fact, it is my opinion that Charlie Crist is now trying to prey on the situation that a lot of African-Americans find themselves in, for votes. Using something that is so real for African-Americans as a political attempt to sway African-American voters to his side is low-down and dirty, and in fact is more of a turn-off then his flip-flops and opportunistic party changes. Sorry Charlie. Still no vote for you. Move over President Obama and Charlie Crist. There is a new hug in town, and that belongs to Florida Gubernatorial candidate Nan Rich and former Secretary of State and, hopefully, 2016 Presidential candidate Hillary Clinton. Apparently Clinton and Rich go way back, and have the utmost respect and admiration for one another. 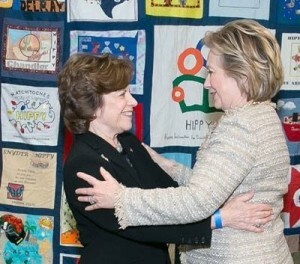 Recently Nan Rich was in Washington to celebrate the 25th anniversary of the HIPPY program, a program that in 1985, Nan spearheaded the pilot project for in Florida — Home Instruction for Parents of Pre-School Youngsters — and soon after, Hillary and Bill Clinton launched the program in Arkansas. Education has always been a priority for Rich, and it’s refreshing to see the two ladies together for a great cause. If things don’t work out for Charlie with the Democratic Party, there is still always “The Rent Is Too Damn High” party he can switch to! !